Creativity is in full bloom at three Springfield Housing Authority developments. Children at Duggan, Moxon and Riverview Apartments are critically assessing and discussing a variety of art works, both classic and modern. And then, they are creating their own art inspired by their new way of seeing and reflecting on how artists create. The results are colorful, freewheeling, intense, eye-catching, and much more. Art by children at Duggan and Moxon Apartments, on display at People’s United Bank on Boston Road. With funding from the Mass Cultural Council, the Innovation Learning Center has provided trainings in the Creative Minds Out of School curriculum throughout Massachusetts. 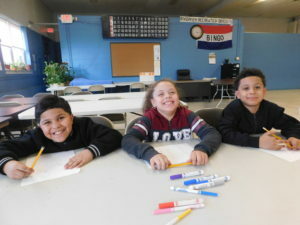 Here in Springfield, the curriculum is being used at the after-school programs at the three developments whose after-school programs are run by ADC Prevention Service of Springfield. Creative Minds is an arts-based curriculum designed to support staff in guiding the creative process with children, providing both structure and flexibility. For participating children, is a perfect blend of doing what they love best — learning, exploring and creating. His twin, Angel, agreed heartily. Twins Angel and Alijah Rodriguez, 9, surround Jannalise Garcia, 8. They are from Duggan Apartments and created art as part of this project. At Duggan Park and Moxon Apartments, children studied collage works by Henri Matisse before trying their own hands at ‘using scissors to paint’ as Matisse did in his later years. Their creations now liven up a corner space at the nearby People’s United Bank on Boston Road, where customers frequently stop for a look. In addition to the cutouts of colorful construction paper, the art at the bank also features an activity involving characters made from a collage process using felt shapes, decals, hearts, candy canes, ribbons, feathers and more. SHA Executive Director Denise Jordan agreed that the more children can be creative, the better people they will be. “This is a great activity for our children. It teaches them about art, and it encourages them to be artists,” she said. 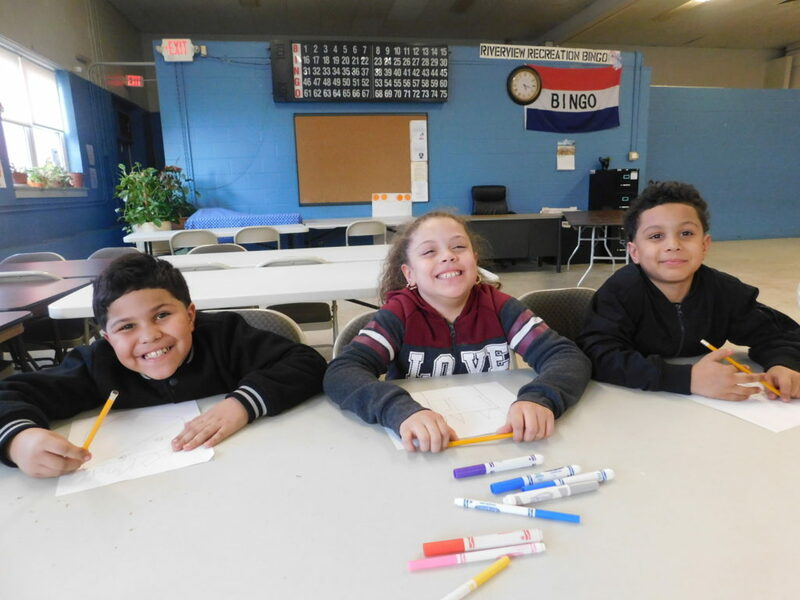 Karen Guillette, who trained SHA after-school providers in the Creative Minds program last December, noted that the activities are designed to familiarize children with how artists think and work and what materials they use. The goal is to build skills and confidence and inspire a love of art among children. 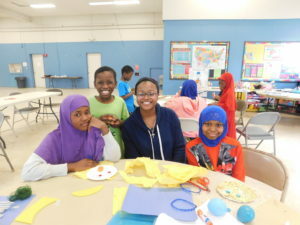 At Riverview Apartments, Fartun Iman, 12, Abdi Mohamed, 8, teacher Jerriah Prude and Manaisha Abdi, 11, exercise their creative skills. At the center of each art activity is a four-part process: Engage children in a discussion of a work of art; provide an opportunity for a free and joyful exploration of artist materials; create freely; and, most importantly, share and reflect with the group. 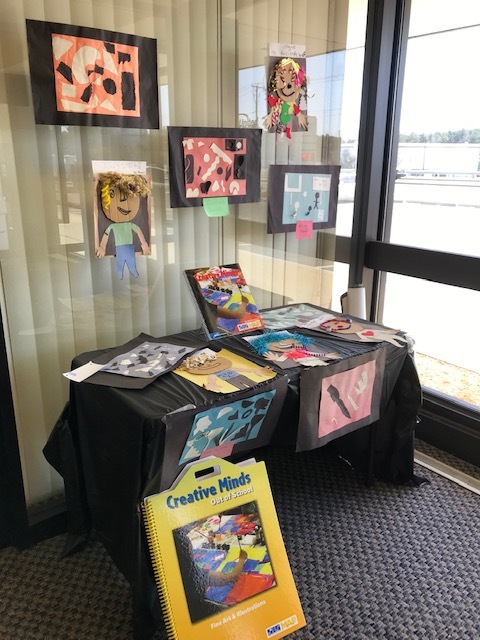 The Creative Minds curriculum also encourages staff to organize a culminating event that showcases the creativity of the children. In the case of Moxon and Duggan, art is now publicly displayed. At Riverview, there will be an art show this summer that will include these and additional work by the children. At Riverview, creation came after discussion. First children looked at characters made by the late Mathew Leighton, who worked with found materials and created characters by combining his love of art with his commitment to recycling and to social change, and Nan Fleming, a local metal sculpture artist. In the busy and buzzing Community Room, children used paints, cutouts and a variety of objects including pipe cleaners, flip tops, fuzzballs and spools of ribbon, they crafted colorful figures. Staff specifically told the children to use their own creative minds and follow their inspirations. 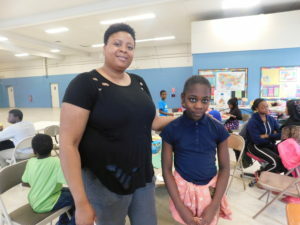 Tina Burston, head coordinator of the after-school program at Riverview Apartments, with Ja’Neyah Carroll, 11. 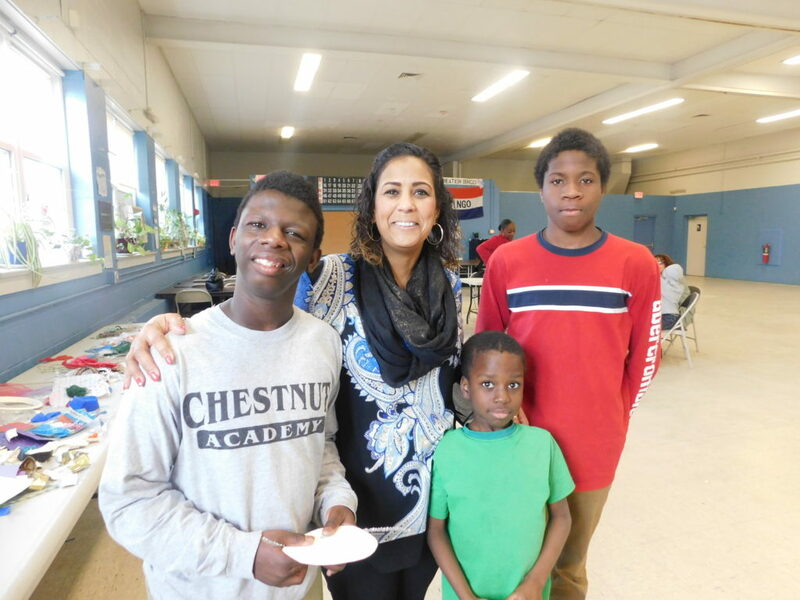 “We told them, have fun, don’t be too serious, and use your imaginations,” said Tina Burston, who is head coordinator of the after-school program at Riverview. For their part, children gave the project high grades. “This is fun,” said Manaisha Abdi, who is 11. Her work featured a gold face mask with big blue eyes. “We get to do what we want on the faces. There are no rules,” she added, smiling. Ja’Neyah Carroll, 11, also enjoyed the activity. Sally Hardy, who is program manager of the after-school programs at the three developments, said staff and children alike appreciated the initial discussions and viewing of professional art, and then the freedom to create their own, using inspiration as it came to them. 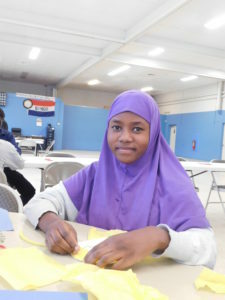 Fartun Iman making art at Riverview Apartments. Hardy said such creative freedom is good for the heart, mind and soul. “Art is a great relaxer, a great coping skill, and we talked about that,” she noted.